A Bukito 3-D printer creates the likeness of actor Bruce Willis at the 2014 International CES at the Las Vegas Convention Center. 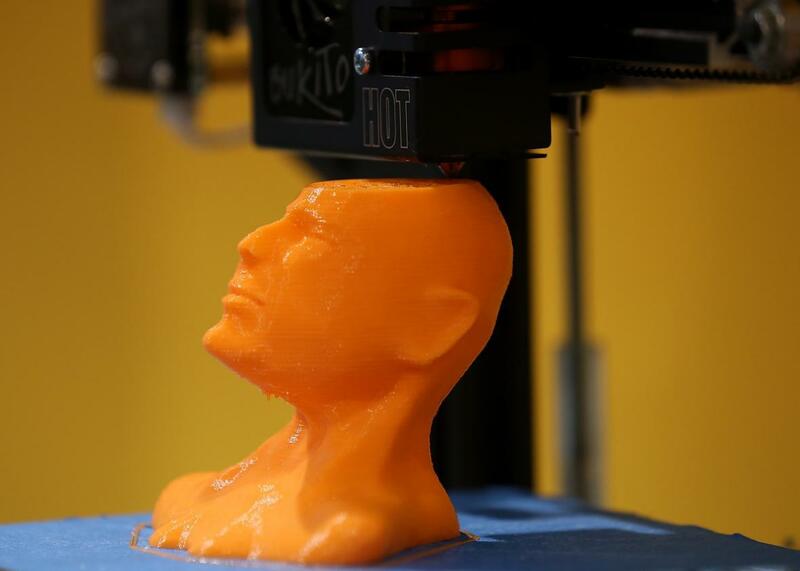 Higher education is obsessed with 3-D printing. Makerspaces and fab labs are sprouting like extruded weeds on college campuses, and everyone from business school deans to librarians is asking how 3-D printing and fabrication can be implemented in teaching. It’s a compelling vision: With rapid prototyping we can create a physical version of any object we can imagine, encouraging students to combine design, critical thinking, and STEM (or is it STEAM?) skills as they remake the world. Even if we could afford a printer for every student, it would still take too long to use the printers in class. And even the swankest university makerspaces are unlikely to have enough machines to serve an entire class of students in parallel. They require tending—printers jam, they require extra filament, parts wear out—that equates to staff hours. Putting together a fabrication space is an ongoing commitment to maintaining regular shop hours, tutoring new students in how to get started, troubleshooting machines at the bit-atom interface, and of course watching Minecraft videos. The space itself becomes the focal point of community, collaboration, and nerdly hangouts where students, staff, and faculty all roll up their sleeves and tinker together. This is a beautiful thing, and a valuable educational tool. But it does not get us any closer to the dream of the Star Trek replicator. And it can occasionally distract us from a second way to use 3-D printers as learning tools, in which the delayed gratification of that lugubrious printing process is a feature, not a bug. One day, the gap between the dream of the Star Trek replicator and the actual replicator will close as the printers and materials we use in them grow more sophisticated. But for now we’re stuck in the awkward adolescent years, when university administrators are wondering whether 3-D printers will become as ubiquitous and important as laser printers once were to the intellectual economy of campus. Our obsession with the ideal of 3D printing is blinding us to a whole set of much more interesting practical applications that are relevant right now, not in the Star Fleet unitard future. 3-D printers are terrible for producing stuff. They’re slow, they’re expensive, they’re monotonous in terms of material. But they’re really good at printing symbols: ideas made manifest. This is what designers and industrial shops use them for—concepts, prototypes, and creative assertions that you can turn over in your hands. We could be doing a lot more of this in schools. One course I designed for Arts, Media, and Engineering is called Prototyping Dreams. (It’s being taught and awesomely reinvented by my colleague Jacqueline Wernimont right now.) The semester is divided into Paper, Pixels, and Plastic: Students start out writing stories and poetry, move on to designing objects virtually, and finally create physical things. In each case the “prototype” has to function as a story, not an engineered tool or technology, and students are encouraged to keep refining the same ideas and narratives they move across media. Basically, we spend the whole semester exploring how you can create symbols that can be shared. When you start from that vantage point, 3-D printing becomes a really useful provocation. Its failures are provocative, too, in a good way. The delayed gratification of actually extruding an object requires students to spend more time refining their designs and closing the gap between the blueprint in their heads and the digital design files they create for the printers to execute. Students spend more time grappling with the story of their object and the actual, physical thing they finally produce is connected to a semester’s worth of symbolic heavy lifting. When you approach educational fab labs as platforms for printing symbols, you open up a crucial and often overlooked conversation about the stories that our stuff tells. Objects have a kind of history to them, even ephemeral objects, and a little waiting around can be useful in forcing us to contemplate that history. There’s a compelling debate about whether the rise of futuristic, replicator-style distributed manufacturing will make the world a more efficient, equitable place or whether it will drown us in a sea of plastic crap (or, you know, even more plastic crap than we already have in the sea). Spending a little less time printing and a little more time thinking could make us better makers, better storytellers, and better humans. Slow food for thought.